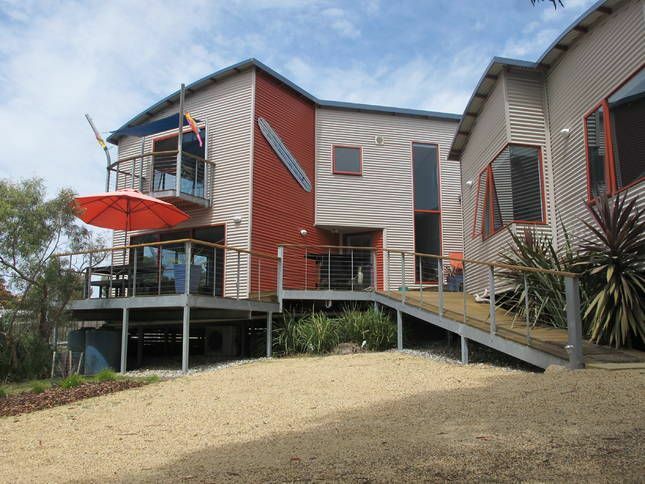 Point Break Binalong Bay offers superb Beach House Accommodation. Year round peace and tranquility and natural beauty, in an environment unsurpassed with pristine sandy beaches, ever changing breathaking ocean views and natural bushland all within in easy reach. Endless bush walks, bike rides, surfing, fishing from the beach and deep sea, snorkelling and scuba diving are all within easy reach, or just relax with a good book, a glass of wine on one of the decks or shaded grounds overlooking the Bay of Fires. Point Break is located in a quiet cul-de-sac five minutes walk to the sparkling white beach and the local cafe at Binalong Bay and is a non smoking, no pets establishment. There is sleeping for up to 7 people in four rooms which can be arranged around two rooms with queen beds, one room of 3 singles, and a single. The bedroom upstairs has its own ensuite, the downstairs bathroom has a shower and tub. There is a separate toilet. Indoors there is a fully equipped kitchen, dining room, comfortable family sized lounge. Outdoors is a gas BBQ and outdoor setting. Point Break Beach House is set up for self catering and features dishwasher, washing machine, dryer, microwave, iron/board, television/DVD/CD player and reverse cycle heat pump. Hi Judy thank you very much for your comments. We are so pleased you enjoyed your short stay. Would love to have you come again some time. The house is beautiful and well equipped. We have everything we need. The facilities are excellent and we had a very pleasant relaxing stay. Strongly recommend. We spent 3 nights in Point Break and had a very relaxing weekend in Binalong Bay. Close to St Helens for shops and supplies should they run low and the area is quiet with a shortish walk to the sea edge. The house was exceptionally clean and neatly presented with everything our group needed for our stay. Hi Colin so glad you enjoyed your stay. Thank you for your review. For also looking after our house, adhering to our house rules and great communication. Would love to have you visit again some time. Really enjoyed our time there. Great location & quiet neighbourhood. Great facilities clean, tidy and well maintained.. Thank you Gayle for your feedback. Hope you enjoyed your family holiday. This house is just beautiful. It's located in a fabulous spot. The provisions were perfect which meant we didn't need to purchase any extras to use while we were there.